Oklahoma City BBall: Your Oklahoma City Thunder Logo, FREE SHIRTS! 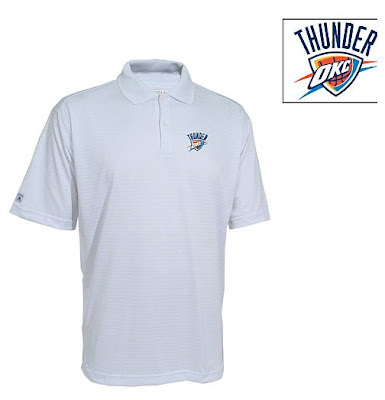 Your Oklahoma City Thunder Logo, FREE SHIRTS! No free shirts, but you can buy some stuff. Word was going to come later this evening, but I guess officials wanted to make some money and sell some merchandise a little early. This confirms the leaked photos of OKC Thunder merchandise last week. Thanks to David H. for the heads up and we will have more news to come very soon. Like what the jersey will look like. That's the worst logo I've ever seen in my life. Terrible logo. Who created the mark? Did the team move to the CBA when they moved to OKC, too, or are they still in the NBA? I love how the colors make you think of clear skies and a bright day--you know, perfect Thunder conditions. Fairly underwhelming design, but they've only had two years to work on it. Sky blue is overdone anyways and pretty weak with no energy and entirely inconsistent with Thunder and red and orange don't go with blue. Bennett doesn't know what he is doing. I guess light blue is consistent with natural gas flame. So that is as much corporate tie in as anything for McClendon / Ward. Figures. Until Durant & Green learn how to defend NBA players or shoot from outside Prezti will be driving the messwagon at the back of NBA wagon-train. Long way to Thunder. Last season they were Thud. Thoughts on the name, The Oklahoma City Thunder?